Ok, so 2011 was a tough year for a lot of business owners. Perhaps you got caught in the maelstrom of economic uncertainty and your business paid the price either by being neglected with marketing or duped by so-called online gurus who promise the world with their wonder products, which ultimately only benefit one person - them. Certain marketing tactics are tried and true because they work year after year, decade after decade. They're proven. And they get results. Affiliate Partnerships/Affiliate Marketing Plan. This includes JVs (joint ventures), affiliate marketing, guest editorials, and editorial contributions. This tactic is extremely effective and cost efficient. The key here is having some kind of leverage then approaching publishers that may want your content or a cross-marketing opportunity to your current list (note: this only works if you have a list of decent size another publisher will find attractive). In exchange for content or revenue share efforts, you and the other publisher agree to reciprocate either eNews ads or solo emails to each other's lists, thereby sending a message to a target, relevant list for free. Well, if you agree on a rev share, it's free as far as ad costs, but you are giving that publisher a split of your net revenues. In addition, you can create a robust affiliate program offering a competitive commission and incentive program as well as using cost-effective, off-the-shelf or WordPress-based affiliate tracking software. The key here is PR, getting the news out about your program to as many targeted locations as possible. Content Syndication. I've written about this many times, but can't stress it enough. Content is king and you can leverage it via my SONAR Content Distribution Model TM, which is the focus of my best-selling book (formerly the #1 web marketing book on Amazon! 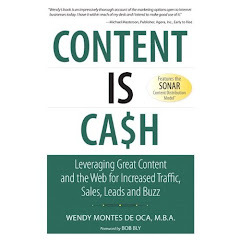 ), "Content Is Cash: Leveraging Great Content and the Web For Increased Traffic, Sales, Leads and Buzz". SONAR is an organic (free) online strategy that is powerful and proven. It's a method of repurposing and synchronizing content (albeit text, audio, video) distribution into various, targeted channels. And it allows companies, publishers, entrepreneurs ... basically anyone with content on their website ... the ability to ultimately turn traffic into sales. SONAR represents the following online distribution platforms:S Syndicate partners, content syndication networks, and user generate content sitesO Online press releasesN Network (social) communitiesA Article directoriesR Relevant posts to blogs, forums, and bulletin boards. SONAR works hand-in-hand with your existing search engine marketing (SEM), social media marketing (SMM), and search engine optimization (SEO) tactics. If you have original content ... you can do SONAR marketing! Search Engine Optimization. In order to drive as much organic traffic as possible to your website you need to make sure your site is optimized for the correct keywords and your target audience. Once you optimize your site with title tags, meta descriptions, and meta keywords, you need to make sure you have revised your site to harness the traffic that will be coming. That means adding eye-catching email collection boxes to home page, relevant banners, and obvious links to get to product pages. You don't want to miss any opportunity to turn traffic in to sales or free newsletter subscribers. Done your SEO already? Great, but you need to review your analytics and visitor usage patterns, keyword history and more and refine keywords quarterly. Online Lead Generation Polls. Incorporating a poll on your website, or having a poll on another site or eNewsletter (via a media buy or ad swap) is a great way to build your list. It's important to spend time thinking about your poll question - something that a hot topic, controversial, and relevant to the locations you're placing your poll. You want to pull people in with your headline and make the poll entertaining. Your answers should be multiple choice and have an "other" field which encourages participant to engage with your question. I've found this "other" field as a fantastic way to make the poll interactive. Many people are passionate about certain subject matters and won't mind giving you their two cents. Then to show appreciation for talking the poll, tell participants they are getting a bonus report and free eNewsletter subscription (which they can opt out of at any time). And of course, make sure to mention - and link to - your privacy/anti spam policy. After you kick off your list building efforts, make sure you start tracking them so you can quantify the time and resources spent. This involves working with your webmaster on setting up tracking URLs specific to each website you're advertising on. It also means looking at Google Analytics for your website and corresponding landing pages to see traffic and referring page sources. Viral Marketing. Make sure you have a "forward to friend" feature in your eNewsletter to encourage viral marketing. It's also important to have a content syndication blurb in your newsletter, this also encourages other websites, publishers, editors and so forth to republish your content as long as they give you author attribution and a back-link to your site. In addition, the SONAR model above incorporates viral buzz in its strategy, so deploying SONAR will help you increase your website visibility and reach. Cost Effective Media Buying. To compliment your "free" online efforts, you may want to consider targeted, low cost media buys (paid online advertising) in the form of text ads, banner ads, blog networks/ads, or list rentals (i.e. eNews sponsorships or solo emails). You're paying for the placement in these locations, so you must make sure you have strong promotional copy and offer for the best results possible. Blog ad networks and online ad networks are a great, cheap alternative and they have a wider reach. Networks to consider: Advertising.com, ValueClick.com, BurstMedia.com, and FastClick.com. You can find a full list of sites here: http://www.imediaconnection.com/resourceconnection/adnetwork.asp. Pay Per Click (PPC). Many people try pay per click only to spend thousands of dollars with little results. Creating a successful PPC campaign is an art - one that I've had success with. If PPC is new for you, then don't start out with the big guys like Google or Yahoo, run your 'test' campaign on smaller, second tier networks. In addition, you must make sure you have a strong text ad and landing page and that the ad is keyword dense. You must also have a compelling offer and make sure you do your keyword research. Picking the correct keywords that coincide with your actual ad and landing page is crucial. You don't want to pick keywords that are too vague, too competitive, or unpopular. You also need to be active with your campaign management which includes bid amounts and daily budget. All these things - bid, budget, keywords, popularity, and placement - will determine the success of the campaign. And most campaigns are trial and error and take anywhere from 3-6 weeks to optimize. Free Teleseminars or Webinars. These are a great way to collect names for list building, then cross-sell to those names once they're in your sales funnel. You can use services like FreeConferenceCall.com, where it's a toll (not toll free) call. But in my experience, if the value proposition of the subject matter is strong, people will pay that nominal fee. Promote a free teleseminar or webinar to prospects (that is not your internal list). Remember, this is for lead generation. So your goal is to give away valuable information in exchange for an email address. You can have a 'soft sell' at the end of the call and follow up with an email blast within 24 hours. But the most important thing is getting that name THEN bonding with them through your editorial. Free Online classified ads. Using http://www.craigslist.org/ or similar high traffic classified sites is a great way to sell a product or get leads. The trick is geo-targeting, picking the right location to run your ad in. Picking the right category. As well as creating an ad that is persuasive and powerful. Ads are free, so why not test it out. For a full list of states and cities, check out: http://www.craigslist.org/about/sites. Reciprocal Ad Swaps. One of the best kept secrets in the industry. Some of your best resources will be your fellow publishers. This channel often gets overlooked by marketers who don't give it the respect it deserves. In the work I do for my clients, I spend a good portion of my time researching publishers and websites in related, synergistic industries. I look for relevant connections between their publications (print and online) and my clients. Let's say I come across a natural health e-letter about that has a list of readers similar in size to one of my clients, who is a supplement manufacturer. Since many of their audience share similar interests, cross marketing each other products (or even lead gen efforts) can be mutually rewarding. Swapping ads will save you money on lead-generation initiatives. Since you won't be paying for access to the other publisher's list of subscribers, you can get new customers for free. The only "cost" is allowing the other publisher to access your own list. It's a win-win situation. This technique also opens the door to potential joint-venture opportunities. Snail Mail. Direct mail is still a consumer favorite - and another good way to get your sales message out. It can be especially effective used in concert with another effort, such as an e-mail campaign. A recent survey published in DM News indicated that 70 percent of respondents preferred receiving unsolicited correspondence via mail vs. e-mail. As with any marketing medium, though, you can end up paying a lot between production costs, list rental costs, and mail shop/postage costs. The most costly direct-mail packages are magalogs and tabloids (four-color mailers that look like magazines). However, 6 x 9 postcards, tri-fold self-mailers, and simple sales letters are three low-cost ways of taking advantage of this channel. Note that copy, list selection and geo-targeting an be crucial for direct mail success no matter which cost-effective mail format you pick. Although 100 percent ROI (return on investment) is what you should aim for, many direct mailers are content with 80 percent. This lower figure takes into consideration the lifetime value of the names that come in from this channel, because they are typically reliable buyers in the future. Print Ads. This is another channel that's gets a raw deal. One reason is because it can be costly. To place an ad in a high-circulation magazine or newspaper, you could shell out serious money. But you don't need a big budget to take advantage of print ads. If you don't have deep pockets, consider targeted newspapers and periodicals. Let's say you're selling an investment report. Try using the Internet to research the wealthiest cities in America. Once you get that list, look online for local newspapers in those communities. These smaller newspapers hit your target audience... and offer a much cheaper ad rate than some of the larger, broad-circulation publications. You end up getting quality rather than quantity. I once paid for an ad in a local newspaper in Aspen, CO that had a flat rate of less than $500. My ROI on this effort turned out to be more than 1,000 percent. How's that for a positive response rate! Most important rule: Know your audience...that will determine placement (and price).